We still see malspam using zipped .js attachments. One popular theme with this sort of malspam is fake resumes . A reader sent us an example last week on Friday 2015-07-24 . That exampleinfected a computer with CryptoWall 3.0 when we checked it out in our lab environment. We saw a different malspam campaign onMonday2015-07-27 deliverKovter and Miuref/Boaxxe. Malspam with zipped .js attachments has continued since I first looked into it earlier this year. Were fairly certain this style of malspam will remain an issue. Most spam filters keep these messages from getting to their intended recipients, but filters are never a full-proof method. As botnets continue to send malicious content to the worlds inboxes, we should always remain aware of the current threat landscape. The technique collects user keystrokes as an individual enters usernames, passwords, and other data into a website. After a training session that typically takes less than 10 minutes, the website—or any other site connected to the website—can then determine with a high degree of certainty when the same individual is conducting subsequent online sessions. The profiling works by measuring the minute differences in the way each person presses keys on computer keyboards. Since the pauses between keystrokes and the precise length of time each key is pressed are unique for each person, the profiles act as a sort of digital fingerprint that can betray its owner's identity. The prospect of widely available databases that identify users based on subtle differences in their typing was unsettling enough to researchers Per Thorsheim and Paul Moore that they have created a Chrome browser plugin that's designed to blunt the threat. The plugin caches the input keystrokes and after a brief delay relays them to the website in at a pseudo-random rate. Thorsheim, a security expert who organizes the annual PasswordsCon conference, and Moore, an information security consultant at UK-based Urity Group, conceived the plugin after thinking through all the ways the typing profiles could be used to compromise online anonymity. LinuxSecurity.com: Bind could be made to crash if it received specially crafted networktraffic. LinuxSecurity.com: Several security issues were fixed in QEMU. LinuxSecurity.com: Several security issues were fixed in the Apache HTTP server. An attack in early 2014 on Anthem, the No. 2 US health insurer, was by most measuring sticks a historic hack, leading to the biggest healthcare data breach ever. New evidence unearthed by researchers from security firm Symantec, however, shows it was business as usual for the hacking group, which over the past three years has carried out more than a dozen similar attacks. Dubbed Black Vine, the group is well financed enough to have a reliable stream of weaponized exploits for zero-day vulnerabilities in Microsoft's Internet Explorer browser. Since 2012, the gang has brazenly infected websites frequented by executives in the aerospace, energy, military, and technology industries and then used the compromises to siphon blueprints, designs, and other intellectual property from the executives' organizations. The targeting of Anthem appears to reflect more of a secondary interest that was intended to further advance a primary interest in aerospace, energy, and other similar industries rather than to target healthcare information for its own sake. "If someone just has Vikram's healthcare records, overall there's very little gain," Vikram Thakur, senior security researcher with Symantec, told Ars, as he described the motivations of the Black Vine group hacking Anthem. "But then you get healthcare information about a Vikram working for a government entity or a defense contractor, there is substantial value in that. This is the kind of data that's used in combination with something else to reach an entirely non-healthcare related goal." Visualisation is a key when you need to keep control of whats happening on networks which carry daily tons of malicious files. virustotal.com is a key player in fighting malwares on a daily basis. Not only, you can submit and search for samples on their website but they also provide an API to integrate virustotal.com in your software or scripts. A few days ago, Didiers Stevens posted some SANS ISC diaries about the Integration of VirusTotal into Microsoft sysinternal tools (here, here and here). The most common API call is to query the database for a hash. If the file was already submitted by someone else and successfilly scanned, youll get back interesting results, the most known being the file score in the form x/y. The goal of my setup is to integrate virustotal.com within my ELK setup. To feed virustotal, hashes of interesting files must be computed. 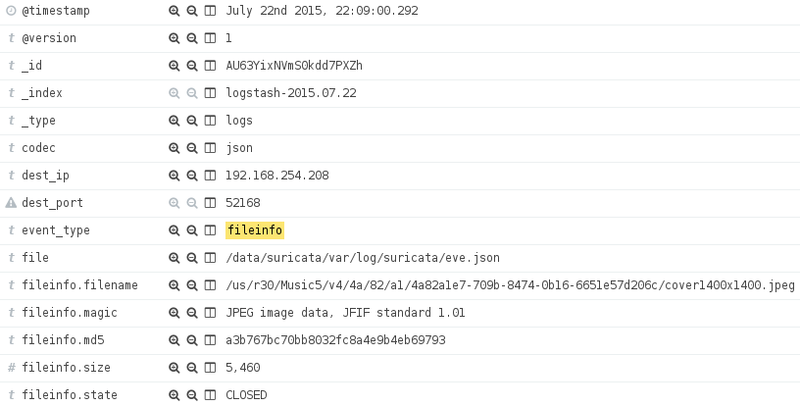 Im getting interesting hashes via my Suricata IDS which inspect all the Internet traffic passing through my network. Now, its up to you to build your ElasticSearch queries and dashboard to detect suspicious activities in your network. During the implementation, I detected that too many requests sent in parallel to virustotal.com might freeze my Logstash (mine is 1.5.1). Also, keep an eye on your API key consumption to not break your request rate or daily/monthly quota. Joshua J. Drake from ZimperiumzLabshas reported a number ofvulnerabilities in the Stagefright media playback system deployed in Android operating system devices. These vulnerabilities permit remote code executionwhen aspecially crafted multimedia message(MMS) is sent to an Android device which can result in the device beingcompromised and Trojaned often exposing all data stored on the device.On some devices it appears that the MMS exploit can be executed with no intervention from the user and in some cases can be exploited completely invisible to the user. It looks like the issue affects all versions of Android 2.2 (Froyo, released 2010)and newer although there is some speculation thatexploit mitigation controlsin the Android Jelly Bean OS (version 4.1+) and newer may thwart some exploits, but the usefulness of these controls is unclear at this time.. It is also unclear from the information available today if patches are available. Google has released patched code to the smartphone vendors, but it appears mostdevice vendors have not yet released updated firmwareto the public at this time. It should be assumed that almost all Android devices are vulnerable, so please keep an eye out for updated firmware for your device and apply the firmware as soon as available. Update: Ugo sent a link to a blog post by Greg Baugeswhich describes some configuration changes which can be made on the Android device which will disable the automatic loading of MMS messages. While these changes donot stop the vulnerability from being exploited it at least makes it so the device useris aware the malicious MMS was received and run. Update: I have been having discussions about the potential of these vulnerabilities for weaponization into a worm. Bruce Schneierhas waded in with a similar idea.